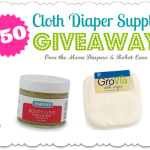 Welcome to the Summer Baby Loving Blog Hop Giveaway, hosted by Cloth Diapering Again, The Inquisitive Mom, and Our Piece of Earth, in celebration of babies and mamas! There are two grand prizes up for grabs, one open to US and Canada, and one open just to the US. Each blogger has a prize worth at least $25 on their blog, so hop around on the linky at the bottom of the page and enter to win some summer baby loving. 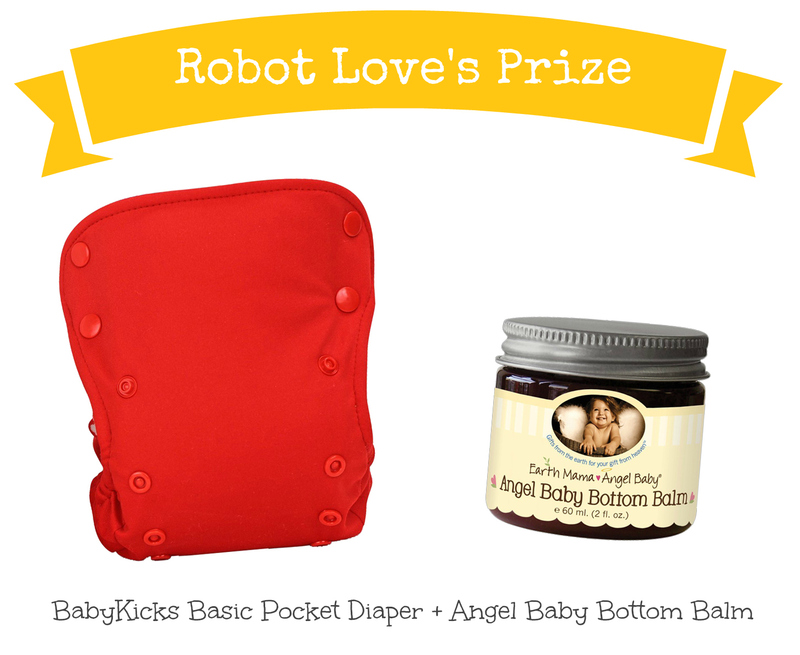 Robot Love is giving away a cloth diaper package including Angel Baby® Bottom Balm (retail $14.95) from Earth Mama Angel Baby® Organics and a BabyKicks Basic Pocket Diaper (retail $15.99), winner’s choice of color and snaps or hook and loop closure. This giveaway is only open to the US, but other giveaways may be open to Canada as well and other countries. You can enter for a chance to win using the Rafflecopter form below! 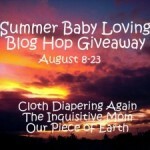 Cloth Diapering Again, The Inquisitive Mom, Our Piece of Earth, and Summer Baby Loving Blog Hop Giveaway participating bloggers are not responsible for prize fulfillment. 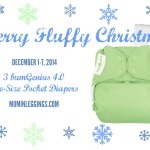 Enter the Merry #FluffyXmas Giveaway to Win Cloth Diaper Fitted, Cover, and Wipes! Ooops, forgot closure type- I think I’d try out the hook and loop! I’d love an all black diaper in hook and loop. Most of my diapers are snaps but a bit of variety is good. I would pick snaps and Meadow. I would choose the sunset color with the snaps. I’d love a black diaper in snaps! Blue is my favorite color, so I’d love to win Azure with snaps! I’d pick meadow with snaps. I love the azure in snaps! Azure would be prefered with snaps. I think I would like the azure in snaps. I haven’t had good luck with hook and loop in the past. I think I’d get Meadow/snap. I would pick Azure and Aplix! I would choose black with hoop and loop! I would like to get the Black velcro for my grandbaby. I would choose black in snaps. The azure with snaps sounds good. I like the black color with the snap closure! I like Poppy with snaps. I’d like the white with multicolored snaps! I would choose black with snaps. I’d love the azure with snaps! Beautiful color! I’d get the Meadow color in aplix. Liking the Azure with aplix! I would choose black with snaps! I’d love to have the White diaper with multi-colored snaps! I think I’d like the Black diaper with hook and loop. My second choice would be Poppy with snaps. I choose the Sunset Hook and Loop. I would like the snap closure in Poppy. I like the white with snaps. I’d like azure with snaps. I would pick Babykicks’ Sunset diaper in hook and loop. I would choose the White w/ multicolored snaps! I really like the black! 🙂 Don’t have one in that color yet! I would get Poppy w/ snaps! I’d love Poppy in snaps. I’ve not yet tried BabyKicks pocket diapers, but LOVE their prefolds! I would choose black with hook & loop. I would choose white with multicolored snaps in snaps. I love the rainbow buttons 😀 hehe I am now a fan of snap cloth diapers … why didn’t I do those sooner? I haven’t tried the pocket diaper before ! I really like the black with snaps. I’d pick meadow with snaps! Black with snaps. Love it. It would match many tshirts. poppy with snap closure would be my choice! Would love an all black diaper with snaps. Been trying to get one of every color to match every outfit. I would love to have a black or white diaper with snaps! If they let me choose a print I would pick the Baby Safari but if a solid I really like their blue! Snapps for us! Their side snaps are interesting I would love to try them! I’d like to try poppy with snap closures! I would choose black with hook and loop closure. Black or Poppy with velcro! I like hook and loop Azure! If I won, I would like the sunset with snaps! These look amazing! I like the snap option and azure as the color! I would get black in hook and loop. I would pick Azure with snaps! Sunset with snaps, super cute! I would like the sunset with the snaps. Or any girly color. I would love to have a black one, with snaps. if black isn’t available I’d pick white, also with snaps. I’d love meadow with snaps! I would choose meadow with snaps. I love the poppy with sanps! I would love the Azure in hook and loop :)! I’d choose black hook and loop. i love the azure with snaps! thanks so much! I would like the sunset color with snaps! I’d pick white with snaps. I would choose either the black with snaps, or the white with snaps. I would get the meadow with snaps. Meadow would be my choice with snaps! I would choose azure with a hook and loop closure. I’d pick black or azure.